600 miles of stunning coastal road links dozens of amazing Californian destinations. Vibrant cities, stunning beaches, vineyards and state parks pepper this popular route. If you choose to drive one American road in your lifetime this is the one to do. Arrive in California, and take a convenient cab from the airport to find your hotel in the hip city of San Francisco. Enjoy an evening meal in one of the city's excellent restaurants before settling in for the night ahead of two full days exploring in this wonderful destination on the bay. A second full day to explore San Fran’s must-see places that are listed in your personalised Road Trip Pack. These “must see” places include Coit Tower, Lombard Street, the Painted Ladies, Union Square and Alcatraz to name just a few. Whilst you’re in San Francisco you simply must experience some of the best Chinese food in the world, thanks to the large Chinese community that call this city home. Before leaving town today try to take in the Golden Gate Park, bigger and more varied than Central Park in New York. This is a must and it’s easy to find Highway 1 south from here. On the way to Carmel, you’ll hit Monterey, the Aquarium is another must see, along with whale watching in the spring and fall. Lastly, take 17 Mile Drive to Carmel-by-the-Sea, this most famous of routes offers Pebble Beach Golf Course, beautiful beaches and millionaire homes. In this quaint and wealthy town, you can stroll down to visit both of Carmel's world class beaches or stroll up the hill to visit galleries, restaurants and beautiful homes. Point Lobos State Marine Reserve lies just a couple of miles south of Carmel, it’s a glorious place to spend a morning or afternoon hiking amongst the coves and along the rugged seascape. This beautiful coastal spot is a firm favourite of the team at The American Road Trip Company, it’s a must for anyone driving Highway 1. Head south down the iconic Pacific Coast Highway to the southern end of Big Sur. This classic All-American drive is at its most dramatic along this 90 mile stretch of coastal driving. Twisting roads curve around steep cliff faces, passing gorgeous State Parks and spectacular vista points that overlook the vast Pacific Ocean. Further south, Hearst Castle perches on “The Enchanted Hill” and overlooks the ocean in the distance. This is an extraordinary home that hosted the world’s most famous and wealthy, today Hearst Castle offers the chance to see fine antiques and art from around the world in an over the top setting. Santa Barbara is an ideal overnight stop for anyone touring the Pacific Coast Highway. This is an affluent town, built in a charming Mediterranean style making it one of the trip's top highlights. 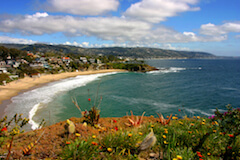 Stroll along historic State Street, visit the Santa Barbara Botanic Gardens or simply enjoy the beautiful beach. Continue driving south down the Pacific Coast Highway passing Malibu’s beaches and coastal homes until you reach Santa Monica in Los Angeles. With its “Baywatch” beaches and old-fashioned Pier, it is a worthy finish to the day. 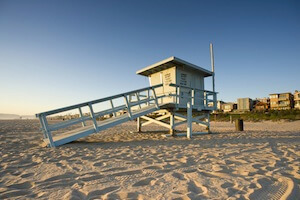 Hire a bike and cruise the boardwalk down to Venice Beach or shop your heart out on 3rd Street Promenade. Tinseltown is synonymous with glitz and glamour, and although many of the studios have now moved on to other parts of the city, it's still fun to visit the home of the Oscars and walk Hollywood Boulevard looking for the handprints of your favourite movie stars. Just a short drive northeast of here lies the Griffith Observatory, perched high on a hill overlooking the city. This famous landmark is well worth a visit and great for views of the legendary Hollywood sign. Beverly Hills offers the chance to see movie star homes with sky-high fences on palm tree-lined streets. Once you've found the homes of your favourite celebrities, you could see where they shop by joining them on Rodeo Drive. Also close by is the amazing Getty Center, this is a firm favourite of the team at The American Road Trip Company - your personalised Road Trip Pack will help explain how to visit this attraction and many other essential places to see in Los Angeles. Leave LA for the short drive to lovely Laguna Beach in Orange County. Along the way, you can visit the exclusive town of Newport Beach and enjoy a walk in Crystal Cove State Park which lies just a few miles north of Laguna Beach. Get up early and you’ll be rewarded with watching the sunrise in one of the many coves that are found here, at dawn, it’s often possible to see dolphins feeding close to shore. Later, you can enjoy the beach, shop in the town's galleries and dine in one of Laguna’s many top restaurants. This old Californian coastal town has such a relaxing atmosphere and plenty of charm, you’ll wish you had longer in Laguna, so feel free to request additional days here or at any point along this iconic route. A short drive down to San Diego along the final stretch of the Pacific Coast Highway, be sure to stop at Torrey Pine State Reserve en route, this glorious spot is right on the road so why not stop off to explore the coastal trails en route? Other highlights in San Diego include Balboa Park, the Gaslamp District and the world-famous San Diego Zoo. After two weeks driving, maybe its time to just relax by the hotel pool or chill on Coronado Beach? If you're looking to do more, your personalised Road Trip Pack has more on the local attractions such as Cabrillo National Monument, USS Midway Museum and the San Diego Air & Space Museum. Tomorrow you'll return your car at the airport before flying back to the UK. Don't forget to check out this road trip's Itinerary tab to see more amazing pictures from our 'Pacific Coast Highway' tour. You'll also be able to read a little bit about what you'll be getting up to on each day of this incredible road trip adventure.